Today was my weekly Team in Training run — I’m training for and planning to run a marathon to raise money for blood cancer research — and 6.61 miles into the run, my iPod Nano froze on me for the first time in the month that I’ve had it (yes, it let me down after I raved about it in my last post). I was really upset that I was not only going to lose my run data, but that I wouldn’t get the mileage credit for the Articulate miles challenge. I ended up doing another 2+ miles for a total of 8.78 miles. So on my drive home from the run, aside from being bummed, I started thinking about how to fix this. I thought that there had to be some way to hack into the iPod to recover my lost run data — or at least simulate the run based on similar run data. Sure enough, I was right: My run data was lost during the iPod crash, but I was given the opportunity to tackle a fun technology challenge. I got home and started doing some Google searches to research the topic before I just started digging into my iPod’s hard drive. I found a couple resources with the info I needed — “MadeUpName’s” method outlined on runpl.us and WalkBlogRun’s method here — and pieced together my own approach that did the trick beautifully. Make sure iPod is set to be a disk (check the Enable disk use box on your iPod Summary tab in iTunes). Make sure you can see hidden system files & folders in Windows (XP how-to | Vista how-to). Copy the entire contents of that folder to your hard drive (2 folders — latest and synched, and 5 files — best, calibration, settings.plist, lastWorkout.xml, and preferences.xml). Now that you’ve backed up the key files, you’re ready to get down ‘n dirty. It just so happened that, in my case, the run I did today was the same run I did a couple weeks ago (February 16) in terms of location, mileage, and rough pace. So that made copying the run data fairly easy. Along with that, I also wanted to ensure my last workout and workout summary data were correct. 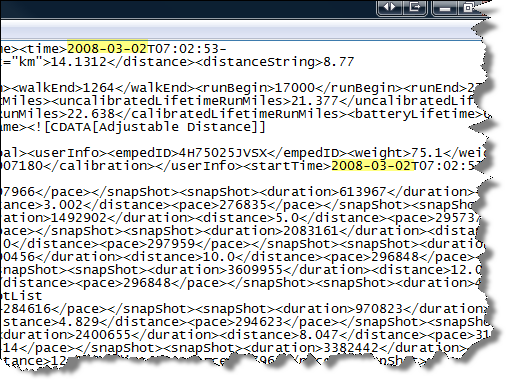 Create or copy your new run data (the XML file named after the date & completion time of your run — e.g., 2008-03-02 08;14;25.xml — that’ll begin with the <sportsData> tag inside the file) to your latest folder. Opened the synched folder and located the data file for the last time I did this run (2008-02-16 08;14;25.xml). Copied 2008-02-16 08;14;25.xml to my desktop. Opened 2008-02-16 08;14;25.xml with Notepad. Saved the file & renamed it to match today’s date and run finish time (2008-03-02 08;14;25.xml). Copied this new file to the latest folder on my iPod — the staging area for runs that have yet to be snyched with iTunes. You’ll also notice in the middle of your run data file that your iPod records your run distance every 10 seconds. Pretty cool stuff. Opened up both 2008-03-02 08;14;25.xml and lastWorkout.xml in Notepad. 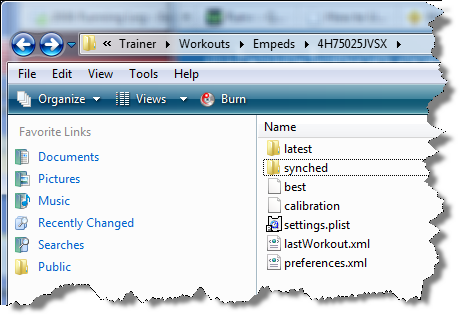 In my run data file, copied from the beginning of the <time> tag to the end of the <lifetime> tag; this includes all the relevant data you need to paste into lastWorkout.xml. Pasted this data into lastWorkout.xml, overwriting the existing values, of course. Referred to my last run data XML file to update lifetime stats in this section to include this latest run data. Opened both 2008-03-02 08;14;25.xml and preferences.xml in Notepad. Incremented my <TotalWorkouts> value by 1 (from 11 to 12). Updated the <TotalCalories> value by adding the <calories> value from today’s new run data file. Updated the <TotalSeconds> value by taking the <duration> value from my run data file, minus the last 3 digits since your run data files measure to the thousandth of a second (in my case, the <duration> value was 4236763, so I took 4236 and added it to 30529 to get 34765, which, when converted to hours, checks out to be my correct total: 9.6 hours). Updated the <TotalDistanceMiles> to include today’s mileage. Updated the <TotalWeightWorkouts> value to 12. Left everything else — like <FarthestMile> and <TotalMarathon> — the same since my longest distance still stands at 10.02 miles (last Sunday) and since I haven’t yet run a marathon. So that’s it! You’re done with the hard part. In iTunes, ejected my iPod. Plugged my iPod back into my computer & confirmed latest run & summary data were reflected. Synchronized my data and uploaded the run to my Nike+ site (I had to login to my nikeplus site again). * At first, my summary data was showing up in iTunes, but not in my iPod, so I did a force reset using the method suggested by Apple, and after that, the new summary data appeared as expected. Success! I learned a fun hack and can now rest assured that my run data — at least the mileage totals — remains (mostly) accurate. Hi .. This is so exciting that so many of you have been able to retrieve your runs! nor can i find the .xml files with a search. are you able to at least plug in your ipod and see it as a drive on your mac? This doesn’t work on the iphone, any suggestions? Thank you for this valuable piece of workaround! i managed to recover a routine 12km run i did today, but ipod nano 4th gen froze on me after i pressed “End Workout”… auugh!! i should have looked for this info last year where I have had several unsynced workouts stuck on ipod are could not be uploaded to nikerunning site, but today’s missing run was too painful to pass up. Thanks again. Hi Clare- doh! Bummer it happened again. I’m not sure what to suggest – other than to stick with the Garmin 🙂 – did waiting for battery to die save the run? i recently upgraded from a 2nd gen nano to 5th gen. i managed to get the workout data from the old unit into my new one. the annoying bit is that the workout history kept showing 2 workouts (1 run and 1 pedometer) instead of 1+54(which is the count of my runs in the old unit). have reset the new nano a number of times, still the same. my itunes is showing the correct info though. have u come across a problem like this? Thanks! !, worked perfectly, if it hadn’t been for you i would have lost a 10k run, thanks!!! Thanks for the great tutorial! I overlooked the step to copy the edited run to the “latest” folder (I had done that once in the past). After that, I got my 8.2km back. You can access the iPhone as a disk, using software (Mac) such as iPhone Explorer (free) or Phone Disk ($10). My iPhone 3Gs stopped recording my 5k run just after 4ks. and I edited the XML files and replaced them on the phone, then did a hard reset but it doesn’t seem to make the changes. Success! I’ve managed to sort it and it’s uploaded to Nike+ correctly! Had to mess around a lot with the XML file, making sure the distance, time, etc all matched up, but now it represents the actual run I did. Hopefully I won’t have to go through all this again in the future! Thanks very much for all the info Gabe! tolucophoto- glad to hear this article helped! But for some reason my run only shows in iTunes but won’t send/synch to the Nike+ website. I did it a bit differently, though, by adding a run on the day before my last run. That way, I didn’t have to make any changes in the LastWorkout-file. But awesome “hack”! Thanks once again! Thanks for info, worked perfectly. Restored my day, was depressed when lost my 8k run data! Thanks again!!!!!! Rob. A shame that something can’t automate to allow this to function correctly. I saw npedit.com but the files no longer synch for me. I switched to MiCoach for a while and wanted to transfer all those runs over to my Nike+ account but alas no. It is funny that Nike works to prevent people editing runs to protect challenges when technically they count for nothing at all. Does anyone know if this will work with the 6th gen nano? I just tried several times, but iTunes says that it can’t send my data because it can’t be validated. I notice that the xml files contain signatures and digital certificates, so I’m guessing that editing them invalidates the signature. Really annoying as this morning I recorded a 5 mile run, but the time showed up as 13 seconds (but with correct start time, end time and a reasonable approximation of the distance). So I tried to correct it, but can’t seem to get it to work. This is what I can’t stand about the Nike/Apple mindset: our software and hardware are perfect so you’ll never need to manually fix anything. My experience today (and several times before) tell me this is ridiculous. These things fail quite frequently. Agree with Rich – there’s no real reason to prevent this. The challenges mean nothing, especially true since for every person who hacks their data to show more, there are probably 10 who don’t bother and get shorted. Rich, I just got this to work with my 6th gen nano. All I did was copy one of my old runs at the same distance and edited and changed the dates. I then saved the file with the new date and placed in the nikeinternal\latest folder. I had ran and synced after the date I needed to add so I didn’t change any other files. After I disconnected and reconnected everything updated without any errors. I have used your advice on 2 occasions now after running on the treadmill without the nike+ pod (the last 2 runs). The first time it worked fine, the second time is uploaded to itunes ok and appeared to send the data through to the nike+ website but the run didn’t appear to come through. Any advice? Does this work with iphone 4s? I can get to an itunes resources folder that just has a bunch of .nib files. My iphone internal storage folder only contains jpegs of my photos. I really wish nike would let you manually enter or modify a run so we could bypass all this! Thank you so much! I recovered todays run easily! This was great. Fixed my problem where a run did not get transferred to the Nike+ site. Simple and quick solution!